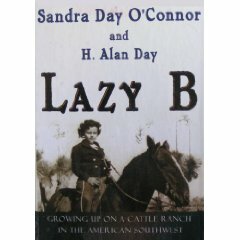 Sandra Day O'Connor was born in 1930 to a ranching family. The isolated location of their cattle ranch near Duncan, Arizona, made formal education difficult. At first, O'Connor was taught at home by her mother. She read profusely, went on long nature walks, and learned valuable lessons from everyday life. Then she was sent to a private school for girls in El Paso, Texas, where she received the majority of her education. O’Connor later acknowledged, however, that she would have rather spent her days “reading and riding” on the ranch. O’Connor began her career in Arizona state government. In 1981 she was appointed by President Ronald Reagan as the first woman justice on the U.S. Supreme Court.